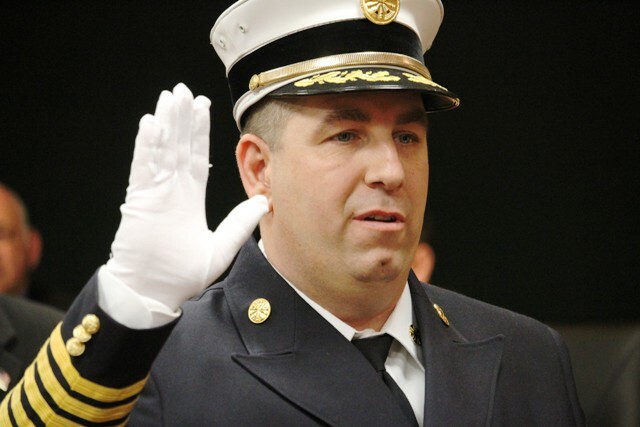 Carl Leppin III was sworn in as Secaucus’s new fire chief. The recent reorganization meeting was as much a family affair as an official governmental function, as town officials swore in newly elected council members, new fire chiefs, and new police recruits. A reorganization meeting generally follows a municipal election in which newly elected officials must be sworn in. But in Secaucus, the event can also include a changing of the guard in the fire department, which appoints a new fire chief, battalion chief and assistant chief every two years. Secaucus has a volunteer fire department whose top brass are elected by the membership of the town’s five firehouses. The membership elects a second assistant fire chief, who is expected to learn the ropes of operating the department before being elevated to battalion chief after two years, and then full chief after four years; he or she serves as chief of the department for a full four years. The members of the five firehouses every two years elect someone from one of the houses to serve as the third ranking chief, who, after two years rises to the second ranking chief, and after four years, to the chief of the department. “Each house gets a chance for one of their members to become the chief,” said Mayor Michael Gonnelli, who himself served as chief prior to his being elected mayor in 2009. Councilman James Clancy, who serves as the council liaison to the police and fire departments, said the first 12 months provides a great learning experience. “These are great men who learn so much,” Clancy said. Carl Leppin III, who was sworn in as fire chief this year, is the son-in-law of former Deputy Mayor and Fire Captain John Reilly. Joseph Shoendorf, who became deputy chief, is from a fire family, as is Fred Schneider, this year’s battalion chief. In accepting his position as chief, Leppin said his four years preparing for the job went quickly although he believed he was prepared. The ritual included the gathering of families who posed for pictures, and well-wishers who packed the normally sparsely-filled meeting chamber. The event also brought out many of the revered fire department leadership of the past such as former Fire Chief George Shoenrock, who has had the rare distinction of being elected fire chief three times during his four decades of service to the volunteer department. In the past, the changing of the guard was sometimes accompanied by a fire chief’s parade and an annual fire department picnic in the fall. The swearing in ceremony always took place in early January, when new leaders inherit the reins of power. While it is a serious ritual, historically there have been humorous or ironic moments. In 1971, firefighters had to rush out of the ceremony in the hall of Immaculate Conception Church to respond to a fire reported at Mayor Paul Amico’s diner on Route 3. The men had to race to their firehouses, many dressed in their formal clothing. Mayor Michael Gonnelli celebrated the change of leadership, noting that the department and town have worked together to achieve a number of successes over the last two years, including expanding the department’s communication system, upgrading firefighter Scotpacks, renovating Engine Company No. 3, and purchasing a new fire boat. This ceremony included the swearing in of three new provisional police recruits who will take a 22-week course at the police academy. “This brings our total force up to 75 from a low of about 58 or 59 when I took office,” Gonnelli said. The ceremony included the swearing in of John Gerbasio and James Clancy who were reelected in November to council seats, and Orietta Tringali, who will start her first four-year term after having won a one-year term last year. 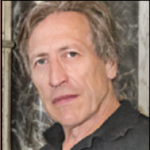 The reorganization meeting also named Councilman William McKeever as an alternative acting mayor if Gonnelli is unable to serve for some reason. Normally, this is merely a formality, but in Secaucus, McKeever was called to serve as acting mayor after Gonnelli suffered a stroke three years ago. Gonnelli has since made a full recovery, but McKeever’s designation was a grim reminder that unexpected events can occur.